The Natural Mind Dharma Center was founded in 1996 by Michael Scott Stevens (Pema Kunsang). 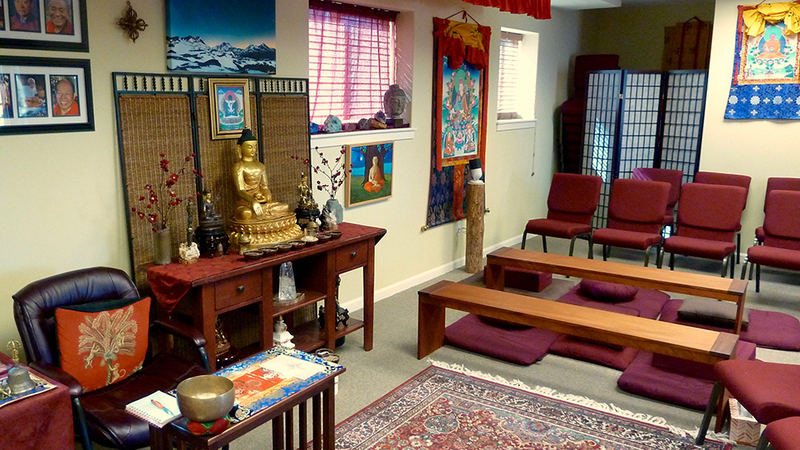 Located on SW Century Drive on Bend’s west side, the Center maintains a full weekly schedule of dharma practices and talks, along with introductory classes, book groups, special workshops, and teachings from visiting lamas. The small center includes a traditional shrine room with an altar and thangkha paintings (symbolic images used for visualization and reflection), as well as a small shop with dharma items and library. Vajrayana is a form of Buddhism that had its highest development in Tibet. Rich in imagery and archetype, Vajrayana employs visualization and mantra (the chanting of prayers in Tibetan or Sanskrit) to cultivate meditation and a sense of sustained inner peace. If we approach these outward forms of the practice with playful curiosity, we open ourselves to their true meaning. The weekly schedule includes Lineage Practices and Dharma Talk Sundays from 8:00 a.m. – 9:00 a.m. and Visualization/Mantra Practices and Shamatha Meditation Wednesdays from 7:00 p.m. – 8:30 p.m. (this is a time for group practices with an emphasis on shamatha meditation). Both these events are appropriate for beginners. There is an event designed to introduce the format and practices of their lineage that is helpful for newcomers at the first of every month.